Over the past year we’ve seen the rebranding of several Toronto staples, namely the LCBO and the Beer Store. While the logos have only been affected so far, branding changes may spill over into their online profiles at some point. So if they want to rebrand their social media accounts they’ll have to make some technical changes so that their online followers can continue to keep up with the latest ‘booze’ news without missing a beat. It got me thinking: how do you keep your online following after rebranding, or even merging? I’ve done some exploring on social media sites to find a solution. So when and if companies decide to rebrand or merge, subscribers can easily find them. When you change your username on Twitter, it will also change your URL. And, you’re done. You can even change your name multiple times, if you’re indecisive. This is about as easy as it gets when it comes to merging or rebranding social media accounts. Twitter is my preferred social media site, but most brands have multiple online presences and Facebook is almost always the next stop. When you want to change your address and name on Facebook, make sure you choose wisely. You only have one opportunity to do so. The same applies for vanity URLs. LinkedIn makes it easy for companies to merge accounts or rebrand. All you have to do is change your company name in the settings area. Then LinkedIn will automatically update the URL to reflect your new name. Sometimes you will be left waiting, so feel free to contact the site if your URL has not been updated within a few days. 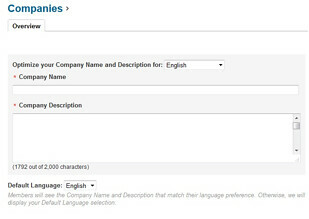 Remember: your company’s LinkedIn account is always associated with a person at your company. So make sure that the creator is a long-term member of the team. Managing LinkedIn pages is usually left up to a digital marketing professional, but creating the page should always be done by the CEO or another permanent member of staff. While you can change the name of your company, Google My Business does not offer a way for companies to change their vanity URL if a merger or rebrand has taken place. So you are stuck with the old one. As of now, the only change you can make is casing of the letters. This is the only situation in which you will have to create a new page if you want to reflect the new brand. However, you can’t transfer reviews from an old page to a new one. With Google My Business, you are stuck between a rock and a hard place when it comes to merging or rebranding. After tackling the big online presences, it is a good idea to claim accounts for your new brand on other social media sites. While Pinterest and Instagram may not be everyone’s cup of tea, you may want to have these accounts handy for future use. Who knows? Maybe, someday, Pinterest may be a great fit for marketing your brand or next new product. For Mergers: Which Account To Keep? Since there is no way to actually combine two social media accounts, you’ll have to pick which one you want to move forward with. This usually comes down to choosing the account with more followers. Then on the other account, be sure to redirect all of those followers to the newly rebranded page. Changing and merging your social media account settings is the easiest part of a rebrand or merger. It should only take a few days to update your accounts to make sure that you maintain your web presence and social authority.